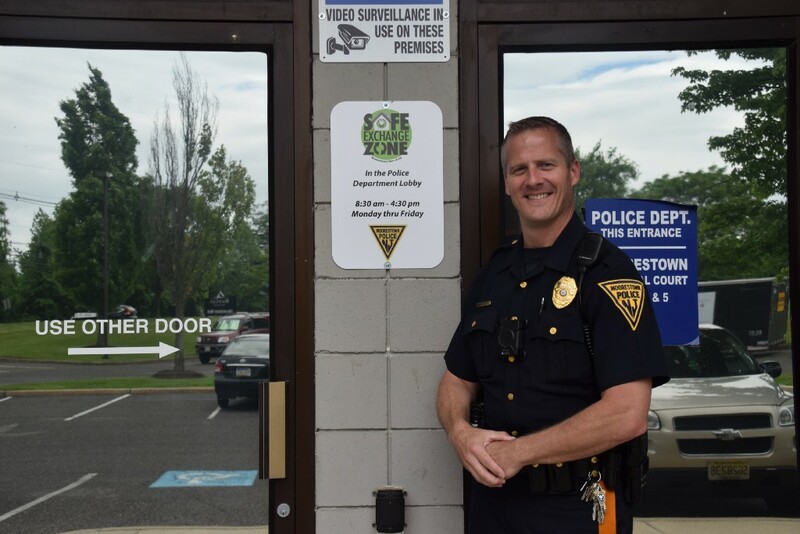 The safe exchange zone is open Monday through Friday from 8:30 a.m. to 4:30 p.m.
Moorestown Township Police Department patrolman Walt Walczak stands outside Moorestown’s new safe exchange zone. When a resident came to Councilwoman Victoria Napolitano with the idea of bringing a safe exchange zone to Moorestown, Napolitano was immediately on board. When the idea reached Police Chief Lee Lieber, a plan was put into action. The Moorestown Police Department modeled the safe exchange zone, which opened in mid-May, after a successful program implemented by another New Jersey police department. The zone allows residents to safely complete sales and purchases through online sites such as Craigslist and Facebook. “The safe exchange space is a simple but important service we can provide to ensure the safety of our residents, and I’m glad that Chief Lieber embraced the idea so willingly,” Napolitano said, adding it’s a great way for residents to get rid of anything they weren’t able to sell at Moorestown’s recent town-wide yard sale. The safe exchange zone is located in the police department lobby, 1245 N. Church St., Suite 2, where a surveillance system is monitored real time. Records unit personnel are nearby and able to quickly summon an officer if a problem develops. While there is also a surveillance system outside, it’s not monitored consistently, which is why Lieber recommends all transactions take place in the lobby. “We didn’t feel comfortable not having it directly monitored real time,” Lieber said of requests to have the safe exchange zone outside the department. Several years ago, a resident was held at gunpoint at the Moorestown Mall while conducting an online transaction. Lieber says the safe exchange zone will help prevent similar situations while giving residents a sense of safety in knowing an officer is only a few steps away. Doug Maute, the resident who proposed the idea to Napolitano, says as a parent with young children he is often amazed at how quickly toys, clothing and other items are outgrown before the end of their useful life. When his wife, Sarah, suggested purchasing items from a local online moms’ group, he was apprehensive. Items prohibited from exchange in the safe exchange zone include weapons, drugs and drug paraphernalia. While officers are available if a problem arises, they do not serve as official witnesses to the transaction, nor do they give legal advice or settle disputes. The officers are not trained or authorized to determine the validity or integrity of an item being sold. With robberies, thefts and other scams becoming more prominent with an increased interest in online trading, the department is hoping residents will take advantage of the safe exchange zone. The safe exchange zone is open Monday through Friday from 8:30 a.m. to 4:30 p.m., and is closed on holidays. The department encourages all residents to engage in transactions during daylight hours, bring a cell phone along in case of emergency and to notify friends or family of the intention to meet with a stranger. The department also recommends against inviting strangers into your home or agreeing to meet at a stranger’s home and to reconsider any transaction in which someone refuses to meet at a police department.